Susanville (formerly, Rooptown) is the county seat of Lassen County, California, United States. 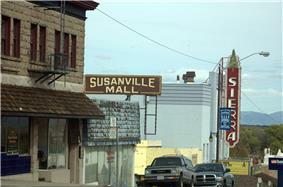 Susanville is located on the Susan River in southern part of the county, at an elevation of 4,186 feet (1,276 m). The population was 17,974 at the 2010 census, up from 13,541 at the 2000 census. Susanville, a former logging and mining town, is the site of the High Desert State Prison, California (not to be confused with High Desert State Prison, Nevada) and California Correctional Center. High Desert State Prison, a maximum-security facility, opened in 1995; the California Correctional Center, a minimum-medium security facility, opened in 1963. The prisons and their effects on the community were featured on the PBS documentary, Prison Town, USA. P.O.V. Susanville is located at . The elevation of Susanville is approximately 4,258 feet (1,298 m) above sea level. It is considered a gateway city to Reno on U.S. Route 395. Susanville was named after Susan Roop, daughter of Isaac Roop, an early settler. The present name was adopted in 1857. The Susanville post office was founded in 1860. Susanville was incorporated in 1900. Susanville has a continental Mediterranean climate (Köppen Dsb) with cold winters and very warm, mostly dry summers. Records have been kept at several stations since 1893, including Susanville Airport and Susanville 2 SW, southwest of the town centre, along with two other stations with shorter records. The population was spread out with 2,559 people (14.3%) under the age of 18, 2,547 people (14.2%) aged 18 to 24, 7,633 people (42.5%) aged 25 to 44, 4,024 people (22.4%) aged 45 to 64, and 1,184 people (6.6%) who were 65 years of age or older. The median age was 33.6 years. For every 100 females there were 273.7 males. For every 100 females age 18 and over, there were 327.3 males. In the city the population was spread out with 20.0% under the age of 18, 13.6% from 18 to 24, 41.5% from 25 to 44, 17.1% from 45 to 64, and 7.7% who were 65 years of age or older. The median age was 32 years. For every 100 females there were 198.3 males. For every 100 females age 18 and over, there were 231.6 males. Susanville Municipal Airport, 5 miles (8 km) southeast of Susanville, serves as a public, general aviation airport. Lassen Rural Bus provided bus service within the city. In the state legislature, Susanville is in the 1st Senate District, represented by Republican Ted Gaines, and the 1st Assembly District, represented by Republican Brian Dahle. Federally, Susanville is in California's 1st congressional district, represented by Republican Doug LaMalfa. Hardin Barry, baseball player and local lawyer, was born and raised in town, and returned to practice law after college and a one-season career in professional baseball. Frank Cady, actor, played Sam Drucker, on Petticoat Junction, Green Acres, and The Beverly Hillbillies. Jack Ellena, former Los Angeles Rams player, was born and raised in Susanville and ran a summer camp near town. Ryan O'Callaghan, NFL player for the Kansas City Chiefs and previously for the New England Patriots. Frank Shamrock, mixed martial artist, adopted by Bob Shamrock of Susanville. ^ a b c Durham, David L. (1998). California's Geographic Names: A Gazetteer of Historic and Modern Names of the State. Clovis, Calif.: Word Dancer Press. p. 423. ^ "Prison Town, USA". Making Contact. Season 11. Episode 31. 2008-07-30. ^ POV - Prison Town, USA | PBS. Retrieved 2010-05-13. ^ a b c d e f g Station: SUSANVILLE 2 SW, CA, Climatography of the United States No. 20 1971-2000, U.S. Department of Commerce, National Oceanic & Atmospheric Administration, Golden Gate Weather Services, accessed 22 April 2013. 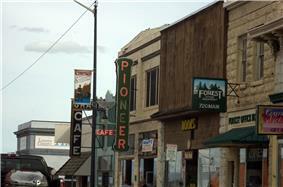 ^ "Susanville city, California." U.S. Census Bureau. Retrieved on September 25, 2011. ^ Aaron Duran – Media Guest of Honor OryCon 34, Oregon Science Fiction Conventions. ^ Magagnini, Stephen (2009-10-31). "Susanville Symphony Hits a High Note in Small Lassen County City".